Dykes Brewery @ Barcelona Beer Festival 2019! We’re super excited to have been chosen as one of the breweries supplying beer to the Barcelona Beer Festival 2019! If you’re in town on March 15-16-17, come taste our beer! 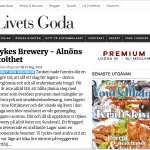 Thanks Beernews.se for the nice article! Follow the link to read more. Boom! 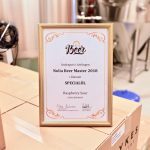 We grabbed second place with our #RaspberrySour at #NoliaBeer2018! Many thanks to the group of judges and awesome visitors for sharing their lovely comments on our beer! Cheers to sour ales and love to all our supporters! Feature in Whisky & Bourbon Magazine! Wow! We’re humbled and proud to get a four page spread in the latest issue of Whisky & Bourbon. Cheers to @livetsgoda_magazine and make sure to pick up a subscription via link here!